The Island: Castaway - An ocean liner was caught in a storm and wrecked in the ocean. A group of people managed to escape having reached on life boats the nearest tropical island. Hardly had they time to make a decision what to do next mysterious things started to happen. One of them finds an ancient inscription on the sand. Being a scholar on classic languages he understands: it can't be a joke from one of the castaways. The Island: Castaway - ocean liner was caught in a storm & wrecked in the ocean. Play the role of Tom Allison and go deep into the island to find out what mysteries are hidden by this forgotten place. 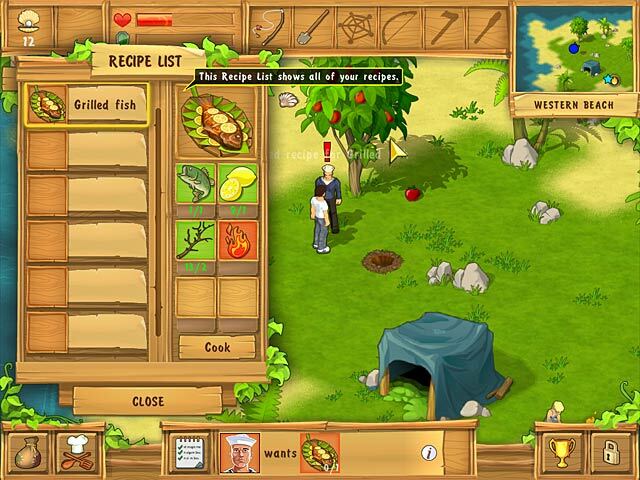 To survive the perils of the island fraught with dangerous wild animals and natural hazards you'll have to find food, collect fruit and grow vegetables. Learn to fish and chase after wild boars, catch snakes and find rare plants. Explore enigmatic island, find clues and solve 200 diverse quests. Are you able to survive and get back home? Plunge into the world of adventures as you play an extremely addictive simulation game The Island: Castaway. Qweas is providing links to The Island: Castaway 1.0 as a courtesy, and makes no representations regarding The Island: Castaway or any other applications or any information related thereto. Any questions, complaints or claims regarding this application The Island: Castaway 1.0 must be directed to the appropriate software vendor. You may click the publisher link of The Island: Castaway on the top of this page to get more details about the vendor.